We would like to take a moment to celebrate the tremendous success from the recent Sunny 95 Radiothon! 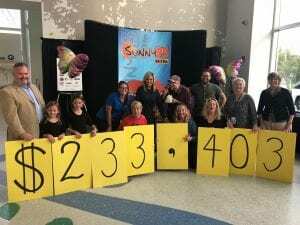 The Sunny 95 team dedicated two full days of broadcast to raise funds and awareness for Nationwide Children’s Hospital resulting in $233,403 raised #ForTheKids! THANK YOU to the entire Sunny 95 team, our dedicated sponsors, our loyal volunteers, and generous supporters! A special “thank you” to Stacy and Bobby for your unwavering commitment to the patients and families served by Nationwide Children’s Hospital! It wouldn’t have been possible without you. Next post: Less than 30 Days to Game Day!